So your business appears to be booming. New customers, orders and projects are coming in all the time and you’re excited about the new growth. Yet when you look at your business bank account at the end of the month there’s no money there. 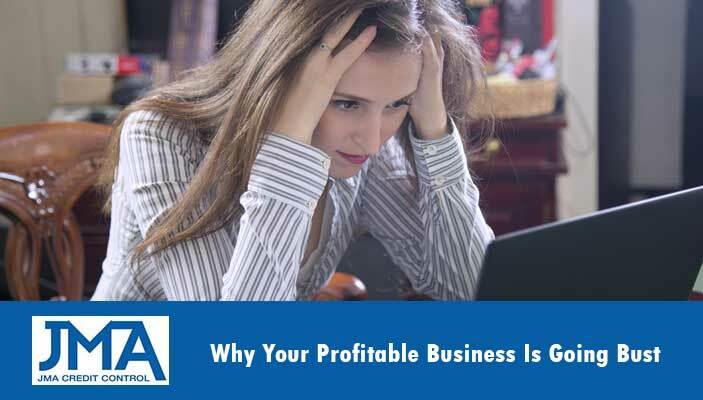 This article will look at some of the common causes why profitable businesses fail, and what you can do about it to reverse the trend and get cash flow coming into your business on time. Increasing sales and profits is obviously a key goal of every business large and small, but it is also crucial that you carefully manage your cash flow. Cash is the fuel of your business and unless you have enough on hand to pay your suppliers, debts, employees and taxes then you will quickly run into troubles. This is why when taking on any new order or customer it’s important to know when the cash flow will come in. Sometimes gaining a larger project or sale can seem like a huge boost to your business yet the time it takes to get paid means that your business will run out of money well before you have a chance to collect the cash. Be sure to always weigh up both profits and cash flow as your business expands. When money is owed to your business it is crucial that you follow up quickly and consistently to ensure you are paid on time. Far too often business owners or managers will be careless about this aspect of their business until one day there is no more money left. To avoid this many businesses hire professional debt collectors to help them follow up with overdue invoices and ensure full payment. This can be a great way to save time, money and stress whilst avoiding cash flow problems. The relationship between when you pay suppliers and when customers pay you is a delicate balance that you must get right. It is always important to negotiate the best possible credit terms with your suppliers (how long you have to pay for goods after you receive them), whilst avoiding offering long credit terms to your customers where possible. If you are always paying for your supplies long before receiving payment from your customers it leaves you vulnerable to cash flow problems. Will reduce late or non-payments and save you time trying to chase up bad debts. When you offer credit to customers it’s wise to know who they are and what their credit history is like. Running a complete credit check on all new customers will protect your business and help you avoid doing business with people who have a long history of not paying their bills. For your business to successfully grow you need to ensure all parts are working together. Yes profits and sales are important but it won’t help you if that cash flow never actually reaches your business bank account. Being mindful of the common issues laid out above will help protect your profitable business from going bust.